Edgar Allan Poe wrote many kinds of stories, some for the newspapers, partly true stories, partly inventions just as the readers liked them. He practised this mixing of fact and fiction all the time, and perhaps that lead him to the crime story "The Murder in Rue Morgue" with the world´s first detective C. Auguste Dupin, as well to some stories which might be called science fiction or fantasy, like "Arthur Gordon Pym" . The French Quarter in New Orleans stills shows us the style. By the way it is easy to forget that Poe was not much younger than Hans Christian Andersen, who was born in 1805. Poe was born in 1809 and lived only to 1849. His poems are romantic but have something in common with Hans Christian Andersens Fairytales: they are meant to be read aloud for an audience. That quality may seem calculated in effect but it also forces the author to concentrate on the words which is one of the reasons both poets have survived the test of time. Another quality they have in common is the ability to make other artists interested in depicting their scenes. Tales of the Grotesque and the Arabesque! If you think of Poe´s "The Tell-Tale Heart" you are not far from Hans Christian Andersen´s "The Red Shoes" - something extraordinary is going on in the subconscious as well as in the surreal or supernatural. And it moves you, sometimes to the hysterical because the senses are influenced by words. På dansk findes der en meget flot udgivelse fra Selskabet Bogvennerne i fire foliobind illustreret af Povl Christensen:Sælsomme Fortllinger. Der er ikke trykt årstal i bøgerne; men de er fra 1950'erne, og da der kun blev udgivet 999 eksemplarer til Bogvennerne, er de sjældne. "Brønden og Pendulet" handler om en fange i Inkvisitionens Toledo, som befries af den franske general Lasalle. Lysstrålen kommer fra en dør, der åbnes ved befrielsen; over fangen svinger et knivskarpt pendul, og ved hans fødder er der en bundløs brønd. I øverste højre hjørne ses et skelet, der svinger et pendul. Væggene bliver glødende og indsnævres omkring fangen, lige indtil befrielsen kommer. 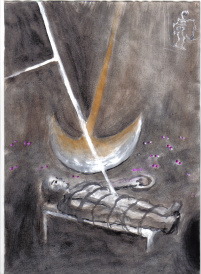 "The Pit and the Pendulum" tells the story of a prisoner in the Inquisition´s dungeon at Toledo in Spain. The ray of light comes thorugh an opned door, where the French general Lasalle has arrived to stop the Inquisition. Above the prisoner a sharp pendulum has been swinging, at his feet there is a bottomless pit. As the prisoner frees himself from the pendulum assisted by the rats with glowing red eyes in the dark which gnaws his ropes he is confronted by glowing walls which are narrowing on him to force him into the pit as the French arrive to free him.